This July, THE LAST WISH will be coming out in trade paperback for the first time ever in the US. 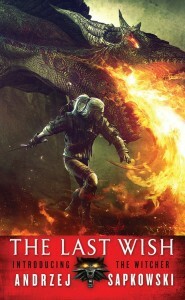 The Last Wish is the opening installment in Andrzej Sapkowski’s New York Times bestselling Witcher series that inspired the hit video games. A boxed set edition of the first three Witcher novels will also be coming this fall in trade paperback. The boxed set will include Blood of Elves, The Time of Contempt, and Baptism of Fire. These new editions are perfect for getting acquainted with Geralt of Riveria for the first time, or for a reread ahead of the Netflix TV series which was recently announced. NEW YORK, NY and LONDON (May 19, 2017) – Orbit (US) and Gollancz (UK) announced that they have acquired a new novel in the Witcher universe by Polish author Andrzej Sapkowski. The Witcher series of fantasy novels, which began with The Last Wish (US | UK), is an international phenomenon, with individual books having appeared on the New York Times and Sunday Times bestseller lists. The most recent, The Lady of the Lake (US | UK), was a USA Today bestseller. Sapkowski recently won the World Fantasy Award – Life Achievement for his career as a fantasy novelist. The new novel, Season of Storms, has never before been published in English and will be translated by David French. It will be a prequel, in which readers will learn the origin story of protagonist Geralt. It is scheduled for publication in May 2018, in hardcover format in the US and trade paperback format in the UK. It will also be available in both territories as an e-book and audiobook. Netflix recently announced that a TV adaptation of the Witcher series is in the works, produced by The Expanse executive producers Sean Daniel and Jason Brown as well as Platige Image’s Jarek Sawko and Tomek Bagiński, who is an Acadamy Award-nominated director and will direct at least one episode per season. The Witcher series is also the inspiration for the popular video game series of the same name. Andrzej Sapkowski is one of Poland’s most successful authors, selling more in his own country than Stephen King or Michael Crichton. He has won numerous awards including the DAVID GEMMELL LEGEND AWARD and the GRAND PRIX DE L’IMAGINAIRE. Born in 1948 in Łódź, Sapkowski studied economics and worked as a financier until the success of his fantasy cycle about the Witcher, Geralt of Rivia, turned him into a bestselling writer. His books have now been translated into almost 20 languages and The Witcher games, inspired by Sapkowski’s books, have sold over 20 million copies worldwide. A signed copy of one of his books was given to President Obama as a diplomatic gift by the Polish Prime Minister. Launched in 2007, Orbit is the science fiction and fantasy imprint of Hachette Book Group. Orbit has quickly established itself as one of the market-leading SFF imprints in the US, and the fastest growing imprint in the field. Our authors include New York Times and international bestsellers Joe Abercrombie, M.R. Carey, Gail Carriger, James S.A. Corey, N.K. Jemisin, Ann Leckie, Kim Stanley Robinson, Andrzej Sapkowski, and Brent Weeks. In recent years, we have published two Hugo Award winners: The Fifth Season by N.K. Jemisin, and Ancillary Justice by Ann Leckie, which became the first novel to win every major award in the field. Hachette Book Group is a leading trade publisher based in New York and a division of Hachette Livre (a Lagardère company), the third-largest trade and educational publisher in the world. HBG is made up of eight publishing groups: Little, Brown and Company; Little, Brown Books for Young Readers; Grand Central Publishing; Perseus Books; Orbit; Hachette Books; Hachette Nashville; and Hachette Audio. Gollancz is the oldest specialist SF & Fantasy publisher in the UK. Founded in 1927 and with a continuous SF publishing programme dating back to 1961, the imprint of the Orion Publishing Group is home to a galaxy of award-winning and bestselling authors. Through our long-running SF and Fantasy Masterworks programme, and major digital initiative the SF Gateway, Gollancz has one of the largest ranges of SF and Fantasy of any publisher in the world. THE LAST WISH is a New York Times Bestseller! Congratulations, Witcher fans, THE LAST WISH (US) by Andrzej Sapkowski is now a New York Times bestseller! Geralt of Rivia is a witcher. A cunning sorcerer. A merciless assassin. His sole purpose: to destroy the monsters that plague the world. But not everything monstrous-looking is evil and not everything fair is good. . . and in every fairy tale there is a grain of truth. Magic and war combine in this action-packed first book in the internationally bestselling Witcher series that inspired the video game. Also, be sure to check out the rest of the Witcher novels here.